Dubai: Off-plan property sales in Dubai crossed 1,500 units in October for the first time since May (when it totalled 2,006 units sold) — though still not enough to bridge the gap between 2017’s stellar performance and this year’s. In the year to end October, off-plan transactions are down by 28 per cent — 14,475 units compared to 20,235 units in the first 10 months of 2017, figures from Reidin-GCP show. But there seems to be hardly any lag when it comes to ready properties. The difference between end October and last year is a marginal 134 units. Deals involving ready homes totalled 9,865 units between January to end October, while 2017 saw 10,099. The next eight weeks could well see ready properties sold this year overtaking 2017’s by a decisive margin. Dubai’s developers with upcoming completions have a reason to keep their fingers crossed. Market sources say that interest among potential buyers, especially for sub Dh1.5 million homes, is steady and most of these leads could well translate into actual sales before the year is out. In the year to now, prices are down by 5.6 per cent from the 2017 levels, according to Reidin-GCP. Price drop in Dubai since the mid-2014 peak is now at 21 per cent. Since January 2017, it is averaging 9.8 per cent. The premium of Dubai’s property market seems to be taking care of itself, and a handful of major launches are being lined up. This includes Meraas’ “Amalfi” villas on Jumeirah Bay, and in close proximity to the Bulgari-branded residences and resort. But for less niche off-plan launches and subsequent sales, the immediate outlook is less rosy. “Dubai Land Department data shows 12,448 units launched in the year-to-date as opposed to 51,718 units in 2017,” said Sameer Lakhani, managing director at Global Capital Partners, the real estate consultancy. “In November and December, there are expected to be a number of launches, which is the pattern every year, but at this stage it is likely that the final tally for the year will not exceed 20,000. 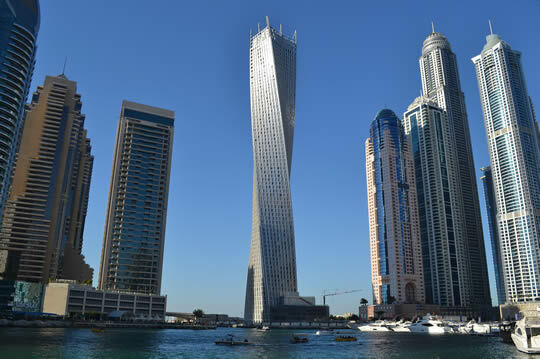 So, outside of the likes of the Palm, Dubai Marina and Downtown, what are the new locations on the ready buyer’s radar? There is the Creek Harbour neighbourhood, and buying interest could see a spike along with the first tenants moving into the first tower some time early next year. Average prices at the Creek Harbour are now at Dh1,466 a square foot. Another location where ready could see heightened activity is Mohammad Bin Rashid City, where the average is Dh1,423 a square foot. “Transaction volumes do not appear to suggest a surge of interest,” said Lakhani. “This however, could also be due to a function of delayed registration of transactions, which is fairly common in the off-plan space. ■ This year, there have been only five months when off-plan transactions went past 1,500 units as against last year, when this was achieved 11 times. ■ In six of those 11 months, sales went past 2,000 units each. This year, that tally was crossed once — in May. ■ The most popular location, by some distance, for ready home buyers is Dubai Marina, with 1,342 units sold in the first 10 months. And that’s only 13 per cent down from last year. ■ When it comes to off-plan buying, Jumeirah Village Circle remains the top spot, with 1,337 units sold. ■ In value terms, Dh16.9 billion worth of ready homes have been sold, which is a 7 per cent decline from 2017. ■ On off-plan, the drop in value terms is quite stark — 37 per cent down to Dh18.5 billion as of end October.